i am SUPER full of excitement for this one. pumpkin. black and white cookies. together as one! amen to that. these are stuff dreams are made out of. happy beautiful dreams. the ones that you try hard to make your brain continue after you annoyingly wake up in the middle of the night. 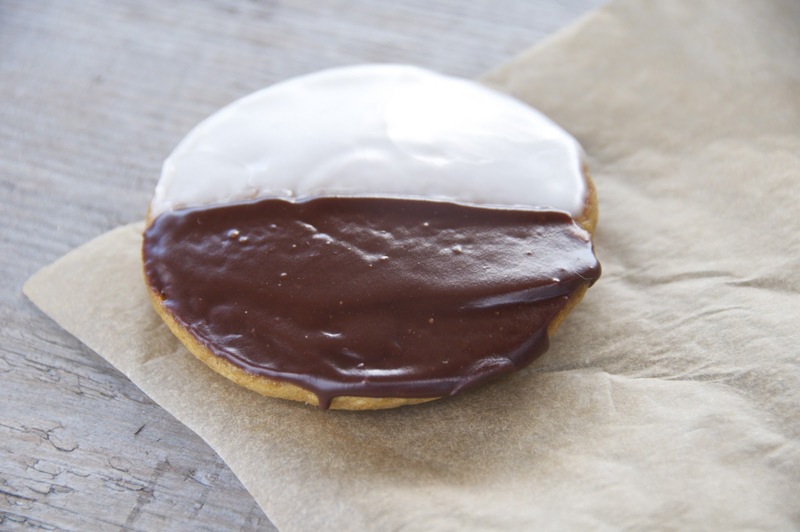 tonight i hope i dream about pumpkin black and white cookies. i hope i'll sit down to a big metal platter with a large number of them arranged nicely. there will be a goblet of fancy champagne. and i won't ever have to wear eyeliner to look awake. and then i will proceed to eat these cookies as messily or daintily as i so please. and in the morning i will not have a massive stomach ache nor extra buldging love handles. and the best part, i will still have a bunch of cookies in the kitchen. stick your nose up to them. seriously. donuts. the flavor of fall + glaze. with a good dose of salt to keep all that sweetness in check. 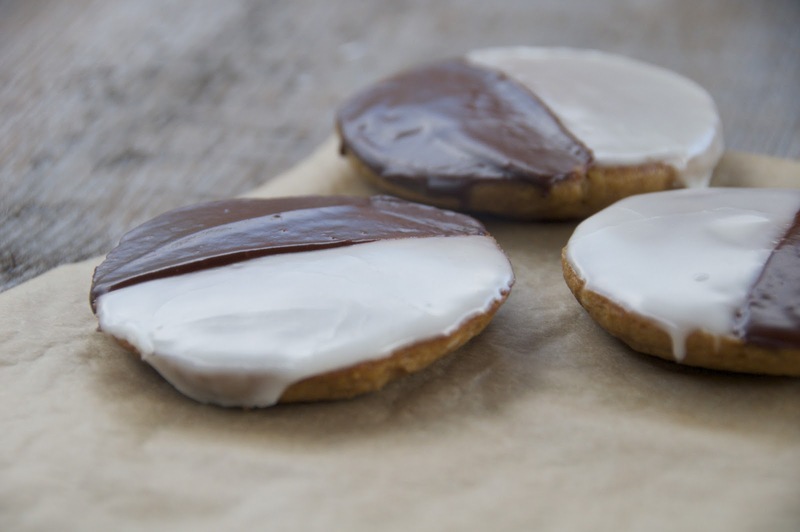 after a day they get a little gooey on the inside where the cookie meets the glaze. and there is cinnamon in the chocolate glaze. because right now, spice is nice. and i want it in my chocolate. 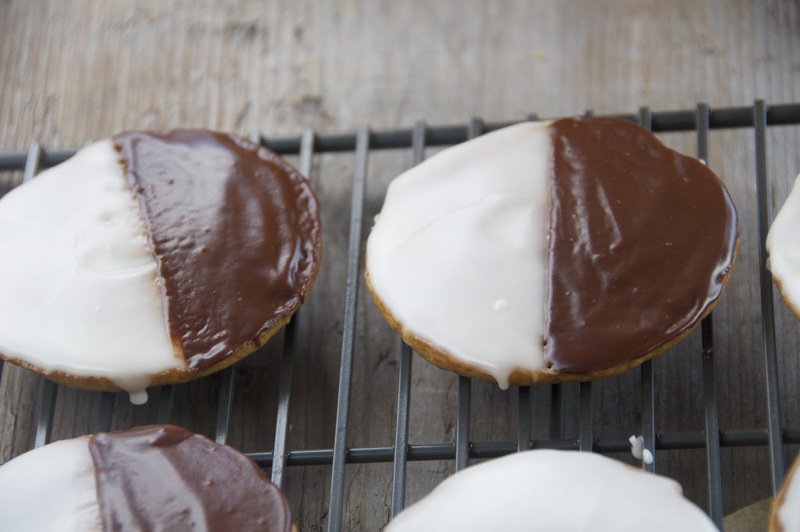 this recipe will yield you a looot of black and whites. around 45.
for the chocolate glaze: melt the chocolate and butter together in a double boiler (or you can use a microwave). whisk in the corn syrup and cinnamon until it's glossy and smooth. 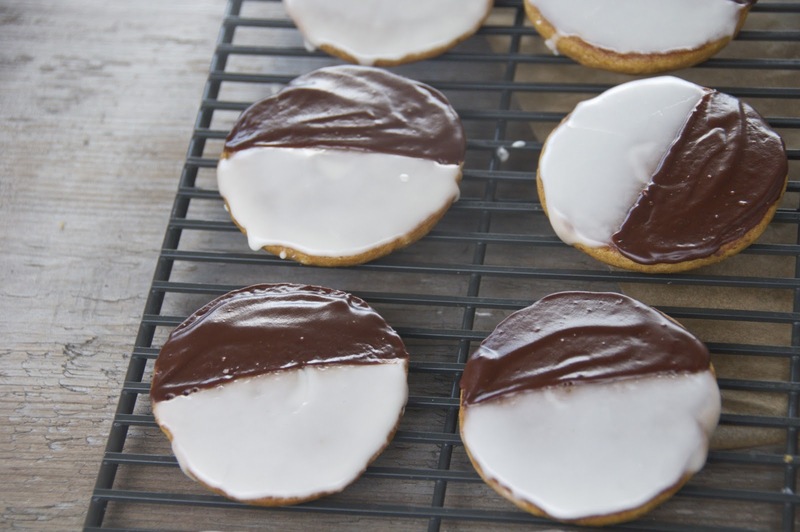 frost the other halves of the cookies with the chocolate glaze and set them out for the glazes to firm up a bit. these look absolutely amazing!! 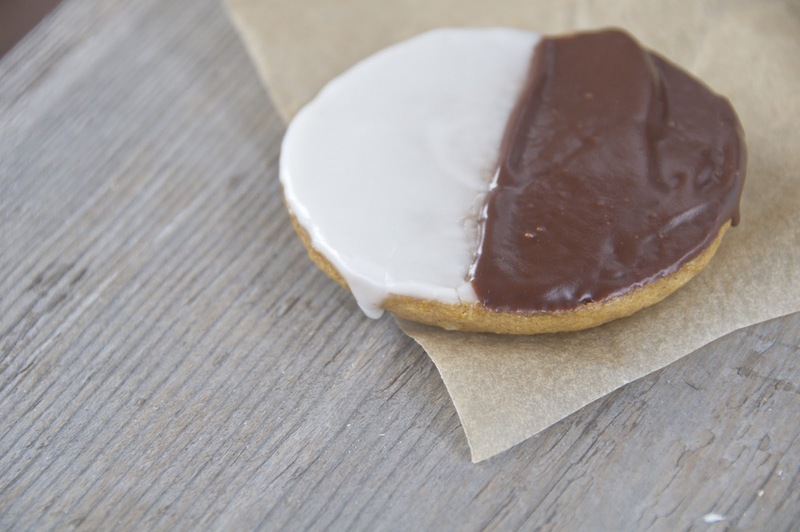 Great combination of a classic cookie and fall flavors! dear god these look delicious. i am salivating and it's 2:38 in the morning. i only wish these were awaiting me in my kitchen...you should come to my kitchen. Cute cookies! I think I will add a little twist in my version of your cookies. Instead of a straight line dividing the vanilla glaze and the chocolate glaze, I'll curve it a little to make it look like yin-yang symbol. I remember that being very famous especially for Chinese descent. Excited much...Thanks for the post! These look AMAZING! :) I love the twist on both pumpkin and black & white cookies. Love your blog! this looks like pretty much the best idea ever! great blog! These look so, so good! 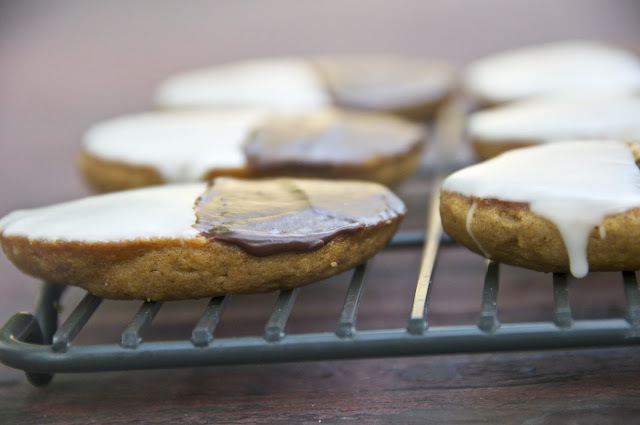 I love pumpkin anything...so I will have to give these a try soon! 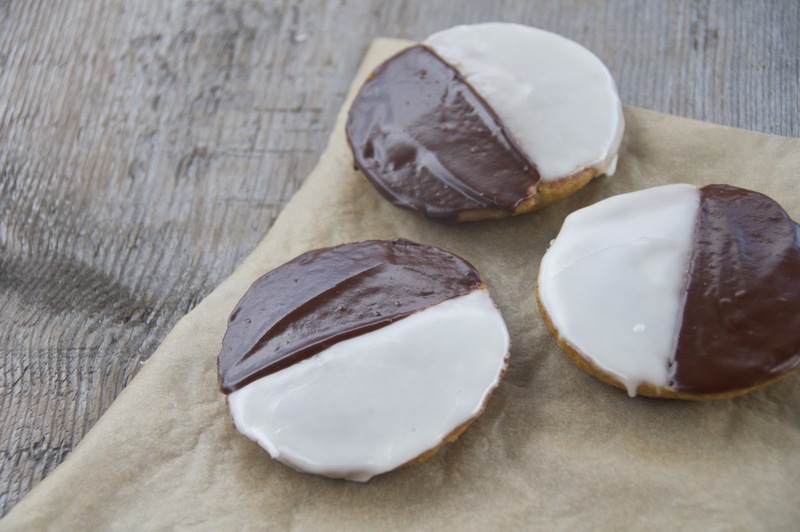 amen to pumpkin b&w cookies! Great idea - they sound yummy! You have totally just blown my mind. i am making these tonight and sending them to one of my guy friends out in cali - i know these are going to be a hit! Brilliant! 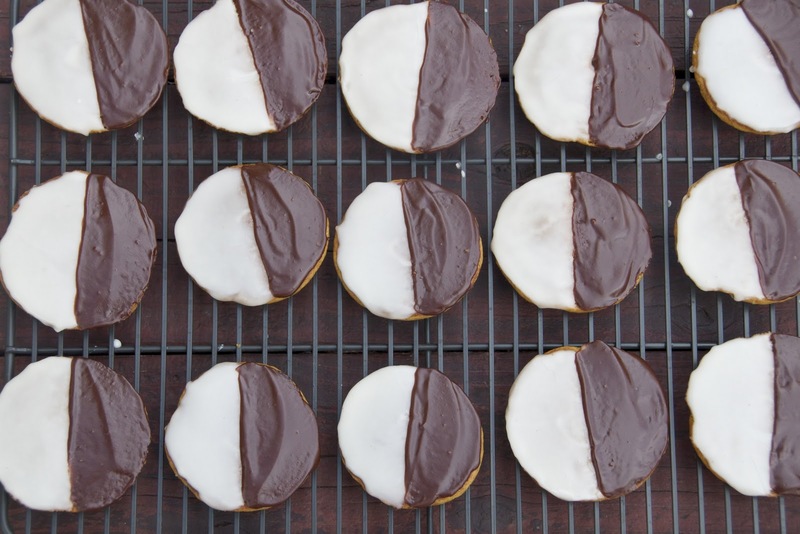 I've been meaning to make B&W cookies for a while, but you have sold me by adding pumpkin and cinnamon flavors. Must these be piped? Or would scooping be sufficient? The look so good!